Ray from ktronicslc.com replied to my mail with more informations about the CL9 CORE Firmware rebuilding. Because I do not have a DOS Windows computer I seem to be stucked here. thank you for the informations! It seems I need to get in touch with serial interfaces... Can I use a Macintosh or Windows XP computer to do the job? The software looks like Windows DOS? the first thing you need is the serial interface box. As the info says, these programs only run under PC-DOS - they are not Windows (GUI) based. Once the interface box is assembled, you run the program which sends data through an RS-232 serial port to the CORE. You need to boot the computer with PC-DOS (MS-DOS, etc), most likely using a floppy . Then connect the serial interface adapter. The documentation details how to set which port to use. Then run the program that uploads the firmware to the CORE. An older Windows computer would work fine. You are probably missing the hardware interface box. This has to be built in order to upload the firmware to the CORE. Good luck. I think I can not bring the CORE back to live actually - to sad. the internal battery makes sure the firmware stays intact. Remember, this was before flash memory so the memory that stores the firmware is volatile memory - It will lose the code when the AA batteries run low. That is why the internal battery is so important. It must have the correct voltage or the the firmware will be lost anytime the AA batteries run low, or are removed. This lithium (internal battery) cell will last a very long as long as the AA batteries are fresh. If you let it sit around so the AA batteries run low, it then draws from the internal battery. This battery does not have the capacity to run very long. It's purpose (and is only used) when the AA batteries are replaced. The firmware is loaded by you, (you program it using a serial interface) so it can't be bad unless your file is corrupt for some reason. If I remember correctly, it will let you now if it did not program correctly. You're picture looks like a unit that has not been properly initialized. Once the internal battery is replaced, it should come right up after you reload the firmware. I hope this makes sense. Good luck! I have added 4 AAA Batteries, but the screen comes up with letter garbage. The Time is set to 11:00 and starts to count, but other LCD elements are highlighted. After 2 minutes the CORE powers off automaticly and I cant wake it up by pressing any button. I need to remove the batteries and add them again to wake up the CORE. If the unit has been sitting idle for a long period time (dead AAA batteries) and you see only garbage on the display or the unit doesn't operate, the first item required is probably a new internal lithium battery. Although the unit was exceptional for its day, a major flaw with the unit was allowing the firmware to be lost if this battery ever lost power (no flash memory back then!). I don't think the designers ever thought the unit would be idle for long periods of time with the user-replaceable batteries going low. In the Manual is a reset procedure described - unfortunately it doesn´t help to restore my CORE. Open the door to the programmers keys. Reseting the WOZ CORE CL9. CL 9 was a universal remote control company started by Steve Wozniak, the inventor of the Apple I and Apple II computers. 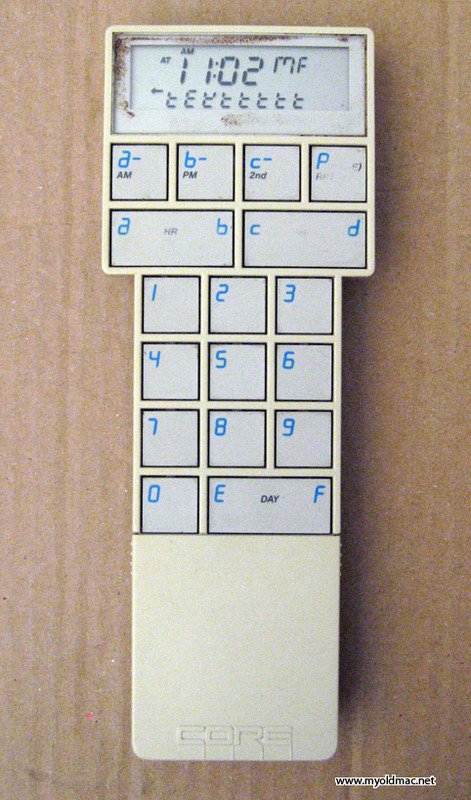 The company was in business for three years, from 1985 to 1988, coming out with the 6502-based CL 9 CORE remote control in 1987, the first universal programmable remote control. My company was CL9 and we built the CORE universal remote control. This was before the simple idea of preprogramming all the codes used by the common companies was done. My device looked at the IR signal and analyzed it and recreated it. It also had to determine if certain codes needed to be emitted more than once to work. My device had 16 user buttons and a few more control buttons. They were all large and finger sized. You could put the CORE into one of 16 keyboards, so you really had 256 total keys to use. Any key could have a sequence of any of the other keys and any IR codes that you read in. So a single key could turn on the TV, then turn on the VCR, then select channel 4, etc. More than that, the 'sequence' attached to a key could access all the control buttons. The lessor used control buttons were covered by a slider to keep things looking simpler. This remote control kept it's own time and could emit IR signals at certain times. 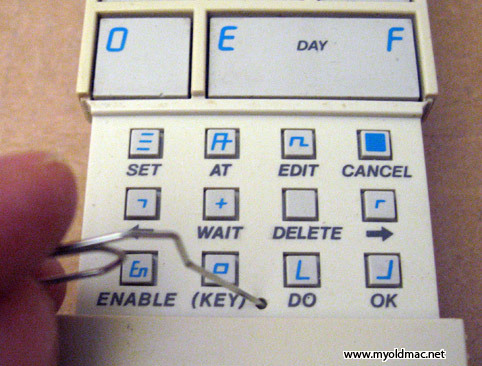 You could hit "AT-5-PM-6" (4 buttons total) to execute button 6 at 5 PM. Even the buttons that programmed the main user buttons could be included in a program. Thus button 1 could reprogram button 2, etc. This allowed a simple level of programming without normal program loops. You could program the remote control to skip daylight savings time with a sequence like "AT-2-AM-Set-Hour up" (5 buttons). I was able to create a program that would keep daylight savings time going up and down on the right days forever, including leap years, but it was quite an effort and required a lot of keys to hold current states. Also, you could connect a terminal to the remote control, with a serial link that we made, and could bring up a lot of debugging aids similar to those on the Apple ][. The 8 bit microprocessor was like an advanced 6502. So you could enter programs in machine code and even operate the LCD display and keyboard. I'm sort of sorry that I didn't take this capable machine further. Apple™, the Apple logo, and Macintosh™ are trademarks of Apple Inc. registered in the U.S and other countries. This Website is in no way endorsed by Apple Inc. All trademarks mentioned on these pages belong to their respective owners (if they still exist). All other content, including pictures is www.myoldmac.net, unless otherwise noted. Unauthorized copying or usage of that content, without former permission from www.myoldmac.net or the rightful copyright-holder, is prohibited. Under GNU Free Documentation License.